I'm always a little hesitant to criticise a trip organised by a group such as the European Coaster Club, primarily because those involved in planning tend to be volunteers who put in an enormous amount of effort for little to no thanks. However, it would be remiss of me not to record some fairly grave errors made by those who assembled the club Italy trip. The first of several embarrassing blunders came to light at Astoria Village, which was well and truly closed when our tour bus pulled up just after lunch time. Signage on the gate indicated that it would be opening for the day at 8:30pm. When the same thing happened to me six years ago there was little choice but to shrug and move on, but a large group can occasionally have leverage. Justin performed some sterling negotiation with someone in the park office, and minutes later was able to report good news; a ride operator had been summoned, and we would be gaining access imminently. When the gates opened our entire group formed an orderly queue at the Brucomela, and though the credit wasn't new to me I decided I'd ride anyway for the fun of it. Daylight allowed me to appreciate the otherwise invisible landscaped garden planted within the ride superstructure, as well as the brightly coloured castle structure taking the place of the usual fiberglass apple. The on-board experience was entirely typical, with a braked drop preventing the train picking up too much speed. We didn't expect to be able to ride anything else, given that the park wasn't actually open, but the friendly staff opened up Extreme, a themed Frisbee of indeterminate provenance located next to the beach with a station building designed to give a near miss effect on every swing. Though I'm not normally a spin ride person I decided that it'd be rude not to give this one a go, and I'm glad I made the effort; the motion was a lot of fun and the cycle time was just right. Our lunch stop was made at a beach-side cafe recommended by the personnel at Astoria Village. Though a pleasant location, the staff on duty were woefully unprepared for a large group and added insult to injury by failing to prioritise those already waiting over new arrivals. Our table didn't have its order taken for over ninety minutes, and rather than apologize, the staff member who eventually served us told us abruptly that we "needed to be patient". Several members of our party elected to make their own arrangements, and honestly the day would have been far less stressful if all of us had followed their lead. We returned to the bus for the journey to Baby Park, but this fell by the wayside due to another embarrassing planning blunder. The coach company had apparently failed to identify that the roads in the vicinity of the park were simply not appropriate for anything bigger than a car, and when our long-suffering driver finally got us there we found the gate locked and lights off. It was apparent that we'd arrived at another park only open in the evenings, and with nobody available for Justin to negotiate with the only option was to abort and head for our hotel. When we got there, however, we learned that only some of our booked rooms were available. Flooding the previous day had rendered a section of the hotel uninhabitable, meaning that quite a few of us had to be rebooked into alternatives, albeit only for the first night of a two night stay. We were given some free food and drink in partial compensation, but it was decidedly suboptimal to have to pack our bags and relocate after night one. Grumpiness was in the air when we finally got into a room, and in the interests of recovery we decided to join a group of intrepid credit whores in an exploration of the local area. Our group of ten met up next to the Bellaria train station, where we purchased one-way tickets for the four minute journey to Igea-Marina, located some three kilometers away. On arrival it was less than a two minute walk to Paperopolis, a small family park with bumper cars, a carousel, mini-golf, and a powered coaster of unspecified provenance. The seats on Dragon were absolutely enormous, being large enough to comfortably fit two fully grown adults, but the staff asked us to sit separately presumably so as to not overstress the motor. The double-oval layout made for a nice change to the usual powered coaster fare, all the more so when the descent phase delivered unexpectedly strong laterals. Luna Park Igea Marina was visible from the entrance to Paperopolis, being less than two hundred metres away at the intersection of Via Pisani and Via Quinto Ennio. 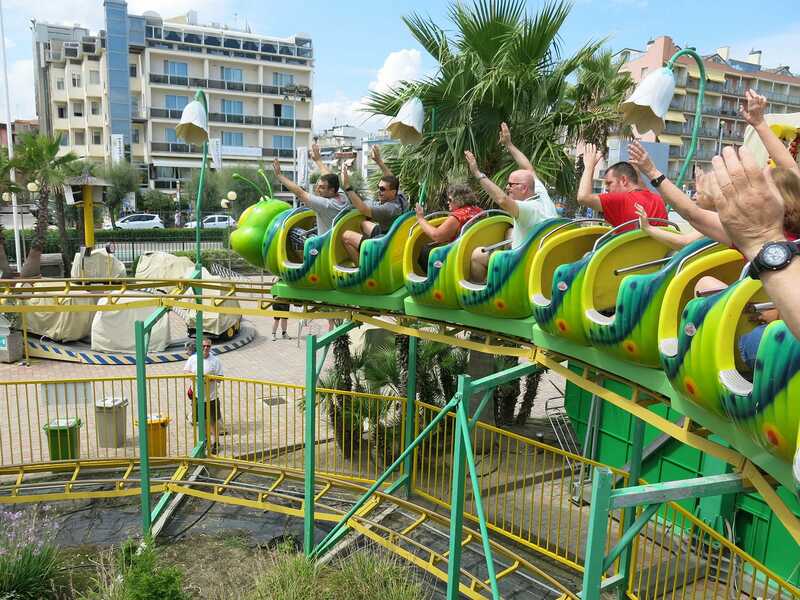 All the rides present were aimed at children, including two wave swingers located side by side, water walkers, and a small powered coaster. Niagara (known on its tokens as Flume Ride) had cars in the shape of log flume boats and a small portable waterfall in the middle of the ride structure, fortunately avoided entirely by the train. The ride programme featured a half circuit in reverse followed by five forward circuits. The reverse portion was surprisingly good; it would have been fun to try the whole layout backwards. A brisk ten minute walk brought us to Baby Park for the second time, and unlike earlier in the day the park was buzzing with activity, with a small queue (!) for the powered Minibruco. The general approach to safety at the park was emphasised by the fact that the lap bar on my car was completely missing and Megan's lap bar barely closed, and it was scarcely a surprise to see the operator on duty disappear to somewhere else in the park while his ride was in motion. The basic figure eight layout was memorable chiefly for a nasty kink in the track immediately prior to the station, felt most prominently by the front four cars; every time the train went through that point one could see passengers being thrown to the side. This got funnier and funnier as the ride continued, to the point that I was laughing myself silly when the time came to disembark. There was no return train available to take us back to Bellaria, and with that in mind we followed Google Maps and our intuition for the walk back to base. This led us to the final park of the night on the Via Del Saraceni, where we found a ridiculously pathetic powered coaster with a height differential of no more than two feet. Caterpillar Coaster was a good reminder of why I don't count powered coasters; the seats were tiny, and the only way I could ride was to sit sideways with the lap bar wide open. For all the silliness, however, there was a catchy soundtrack that played as we crawled around the track at a slow walking pace, and the humour of it all made for a fine end to the day.